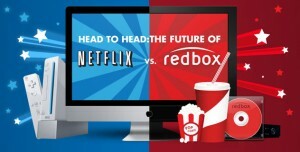 Recently going across digg.com, I saw an article featuring an infographic from RentersInsurance.org squaring off Netflix and Redbox. Now I’m sure I don’t have to highlight who Netflix is, although some people may not know about Redbox. This company provides Kiosks at many retail locations (grocery stores, convenience stores, etc) where you can rent DVDs for $1 per day. Pretty cheap, but how does this stack up to the Netflix price of $8.99 per month for unlimited rentals? It’s not fair to compare $8.99 to $30, as if you’d be viewing far more DVDs with redbox. Day 1 of month: Receive and watch netflix DVD. Send back same day or before mail is collected next day. Day 2 of month: DVD goes off to netflix. Day 3 of month: Netflix receives DVD, ships new DVD. Day 4 of month: You receive new DVD and watch, send back next day before mail collection. Now remember, these take in to account extreme rental activities (i.e. for Netflix, returning the DVD the same day it is received; for Redbox, renting 1 DVD per day). The costs will further fluctuate based on how long you keep the DVD (slow returns equate higher per/dvd cost for Netflix, and late fees and higher overall cost for Redbox), as most users of these services probably will not keep up such a vigorous schedule. In the end, it just depends what you are looking for. I’ve used both servies, and I can tell you that if you’re looking for just the newest movies and there’s a kiosk within your daily commute, then Redbox’s 200+ choices will probably work out best for you. However, if you want to be able to watch older films, lesser known movies, or foreign flicks, then Netflix’s 100,000+ titles is probably the way to go. So that’s the skinny on movies for rent, but don’t forget to see about what we have to say for movies in the theater, like a review of the 80’s action movie Expendables, an early screening review of Scott Pilgrim vs. The World, or an explanation of Inception South Park style. Who gets DVDs from Netflix anymore? I stream all of my movies via instant. Does RedBox have instant? Angie and I were just talking about that very point. We still get DVDs, but Netflix instant is a huge component of what they offer and it eliminates any issue of shipping times. Only downside is that not everything is available for instant, but once it is there’s never a wait. Didn’t find anything that says Redbox has this type of service. Netflix just signed a deal with Epix. Effective September 1, the streaming should get way better. Instant streaming from Netflix is its only saving grace. Especially now that it has looked to mobile devices to screen content. The only problem is that most new movies are not available until three months after pay per view (this is the deal signed for Iron Man 2, How to Train Your Dragon, Shrek Forever After, Killers, and Why Did I Get Married, TOO?. All part of the Epix deal). So if you do want to watch these movies as soon as they’re available for rent, you’ll still be getting DVD’s. In any event, it seems like the Epix deal is gonna end up costing Netflix in the long run, and push them further into the streaming business (as is their cost-saving want). As such, you’ll see Redbox take a more prominent role. We still get our movies on DVD from Netflix and feel like we get exactly what we pay for. The only thing useful for streaming is older stuff and some tv shows… which I really only watch when I am bored and nothing else is on. We almost always have a current DVD waiting to be watched. Should I assume you are all avid RedBox users if you don’t see the use in getting DVD’s from your Netflix account? Or is there some other way you are getting new release DVD’s that hasn’t factored into this price breakdown?